On the other hand, adding someone on the Facebook Restricted list implies that you’re still friends, but that you only share your posts with them when you choose Public as the audience, or when you tag them in the post. 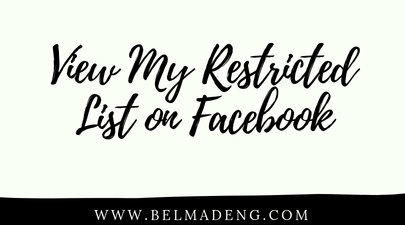 In this post; "view my restricted list on Facebook," you'll see how to add people to restricted list, find your restricted list and how to remove people from your restricted list on FB. Here's a typical example of how a restricted list works; according to the Facebook Help Center, if you're friends with your boss, and you add them on your Restricted list, then post a photo and choose Friends as the audience, you aren’t sharing that photo with your boss, or anyone else on your Restricted list. If your boss goes to your profile, they won't be able to see anything you haven't tagged them in or shared as Public. But, if you add a photo and tag your boss in that photo, or chose Public as the audience, they’ll be able to view it. 2. Next, navigate to the profile of the person you wish to add to your restricted list and continue as instructed below. 5. Finally, click "Restricted list"
3. Click on a friend's profile picture to remove them from your Restricted list. That is how to add, view and remove people from a restricted list on Facebook.